Scotland has no shortage of cute tea rooms, bakeries and roadside cafes with tempting tray bakes. 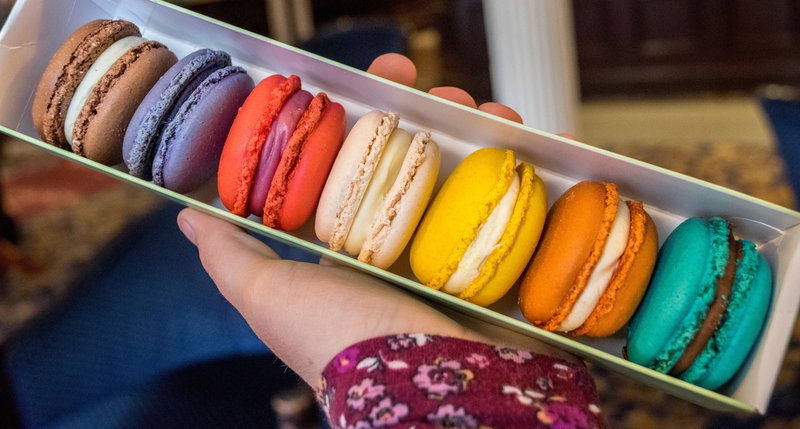 Where are your favourite spots around the country for a sugar fix? 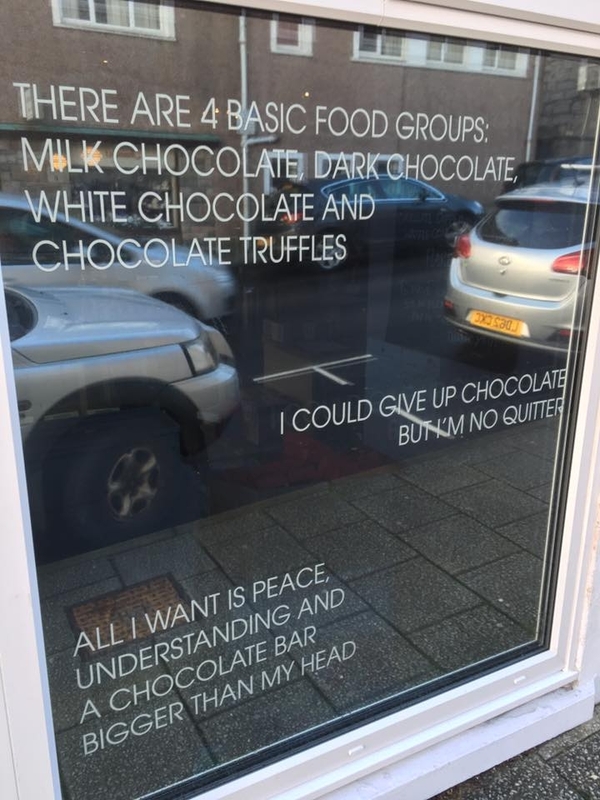 Lovecrumbs in Edinburgh - you'll struggle to decide which cake to choose! Hopefully you can grab a seat inside the window. Gorgeous Cafe in St Andrews - select your choice of scone from the descriptions written on the cafe window. 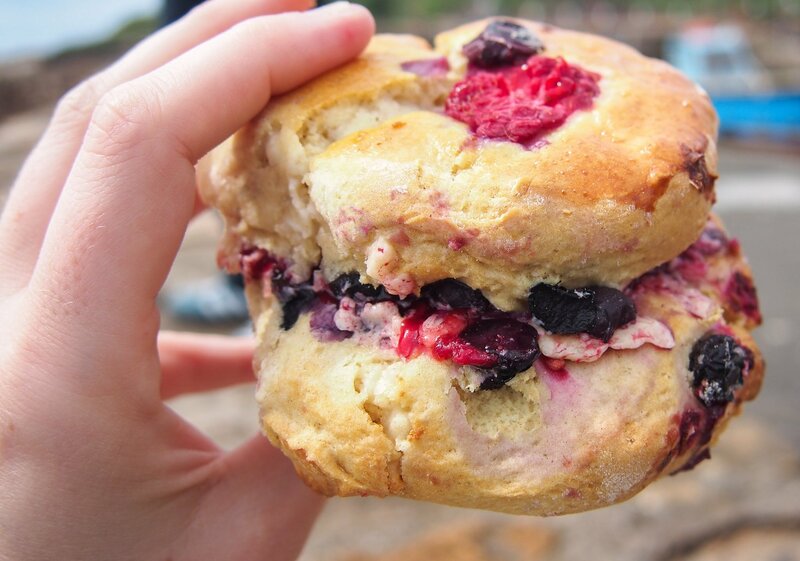 How could I refuse a scone with raspberry, blueberry and white chocolate?! Duo Restaurant in Perth - their homemade French macaroons are AMAZING. I highly recommend the salted caramel, white chocolate, and peanut butter flavours. Eigg Yurts on the Isle of Eigg - when cycling or walking around the island, stop by for some homemade Italian ice-cream and a 'cake of the day'. The strawberry and pistachio ice-cream went down on a treat on a day of cycling in the sunshine. @TheChaoticScot I love Lovecrumbs too, also partial to a Cuckoos cupcake or slice of Mimi's cheesecakes. I'm thinking we should travel further afield, especially is that scone is anything to go by! Hi guys, did you know there is a CakeFest in Stirling this September and a Chocolate Festival in Perth in November? CakeFest took place in Edinburgh last year and at the end, once the judging had taken place, most of the bakers cut up their cake and give it away for free! 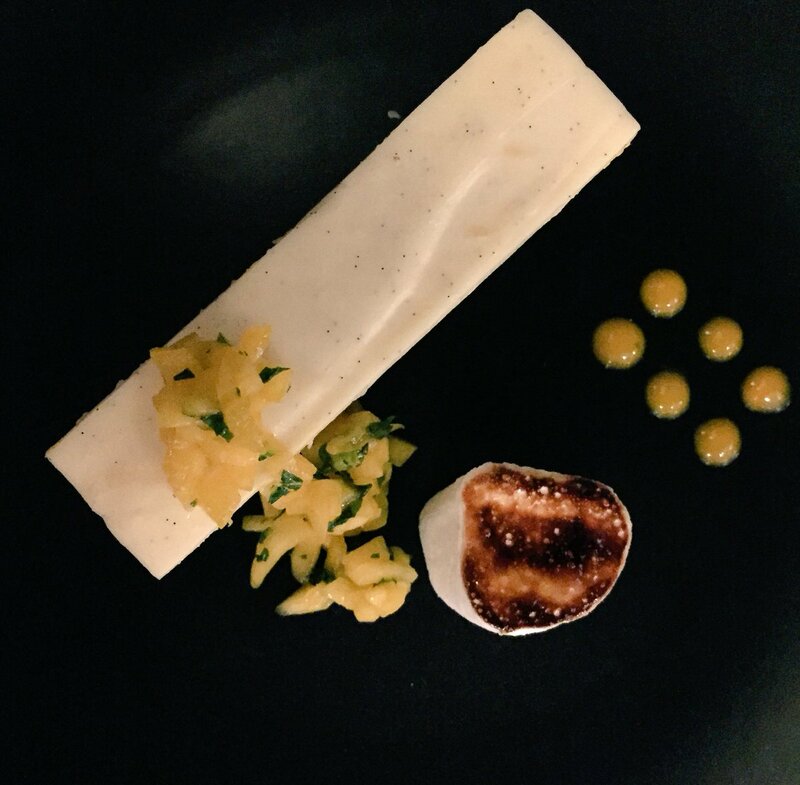 @VisitScotlandHeather - I've actually been lucky enough to blog about the Perth Chocolate Fest, and was a judge for the chocolate competition. It was heavenly, but by about the 30th entry I was starting to feel a bit sicky ha ha. Cake Fest sounds amazing! @TheChaoticScot - that sounds like my dream job! CakeFest last year was an edible map of Edinburgh but this year it's a map of Scotland. I can't wait to see if people can make the Forth bridges, Dunnottar Castle, The Fairy Pools etc out of cake! Oh my goodness @TheChaoticScot ...those pictures look sooooo good!!! My kids have insisted we make a start on the Scottish Ice Cream Trail this summer so I'm looking forward to indulging in some amazing sweet treats. Any flavour recommendations would be most appreciated!! This must be my favourite topic! 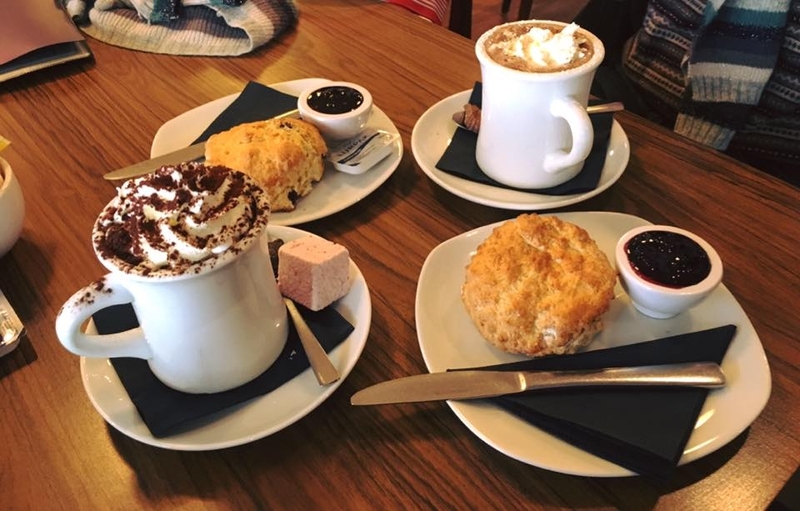 @TheChaoticScot Gorgeous Cafe in St. Andrews has been on the top of my list but hasn't happened yet-your picture is stunning! My favourite place is Leo's Beanery in Edinburgh, everytime we visit the Scottish capital we always find some time to have some cake in this place, extra bonus that it is located in one of the most beautiful areas of the city! I'm definitely expecting some photo highlights when you're back! I've never even heard of the place, so thanks very much for the recommendation. I will DEFINITELY be checking it out! I'm a self-confessed sweet tooth. I love Twelve Triangles in Edinburgh, just off Leith Walk. 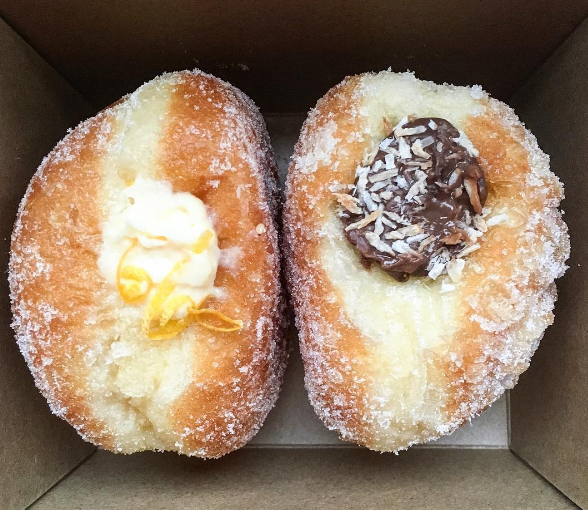 They make the most incredible doughnuts: (these are lemon and ricotta, and chocolate and hazelnut). Delicious!! 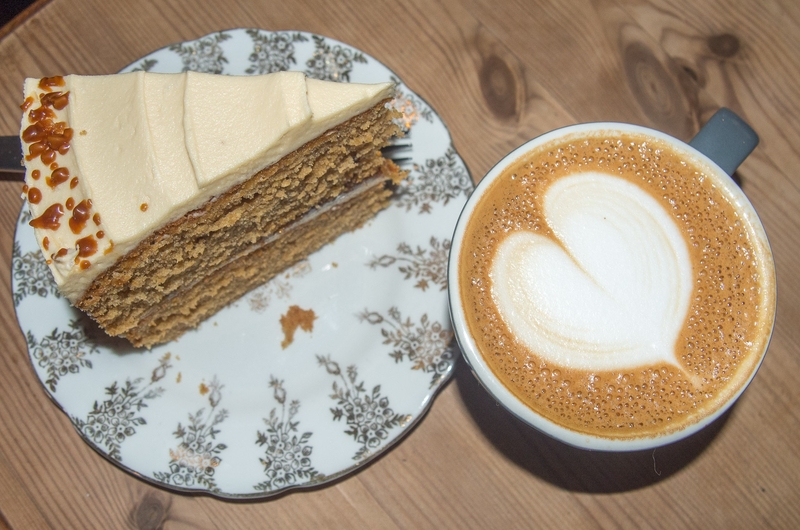 It's fair to say that me and my husband are big fans of cake, we're regulars at the aforementioned Cuckoo's Bakery, Porto & Fi and The Raeburn in Edinburgh, all of which are exceedingly good! A big dipper at Cuckoo's Bakery - didn't last long! A coastal walk and sweet treats sounds like an ideal day to me @Yvonne. Thanks! We got them to make our wedding cakes @TheChaoticScot ! The Peerie Shop Cafe in Lerwick, Shetland make an amazing "Puffin Poo Cheesecake" using local ingredients from the Shetland Fudge Company next door! The Boathouse on the Isle of Ulva hands down for me. They have a selection of the most amazing homemade cakes. 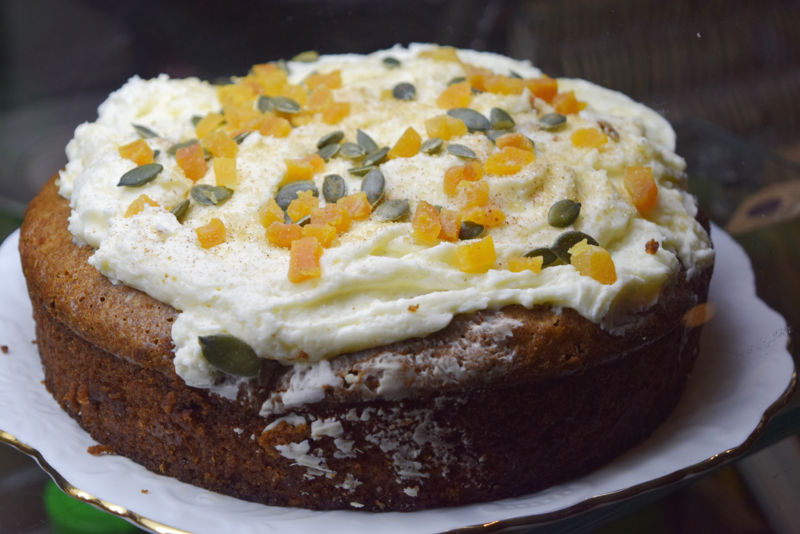 Hike round the rugged island then have a guilt free slab of delicious cake you'll have earned. Another favourite is the Tobermory Bakery on Mull. It's near impossible to choose from their enticing selection. They also do a mean cooked breakfast. 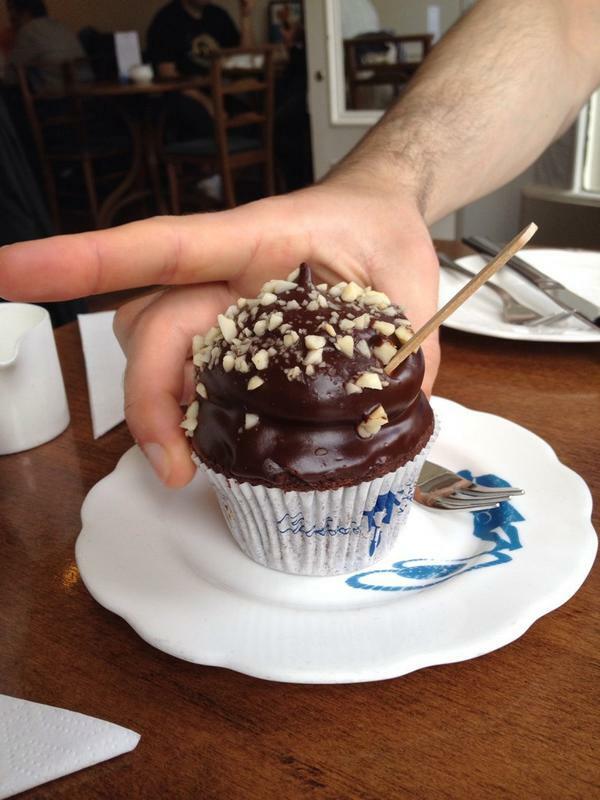 When it comes to sweeties, Sweet Memories in Inveraray. I'm like a kid on Christmas day in that place. Sweetie tobacco, Chelsea Whoppers and Gold Rush bubblegum. All childhood favourites of mine. I can devour a bag of sweetie tobacco like I haven't eaten in a week. What's not to love about sugary coconut. At home in Edinburgh I'm a big fan of afternoon tea at Hotel du Vin and the Bollinger Bar at the Signet Library which opens in summer during the Fringe. 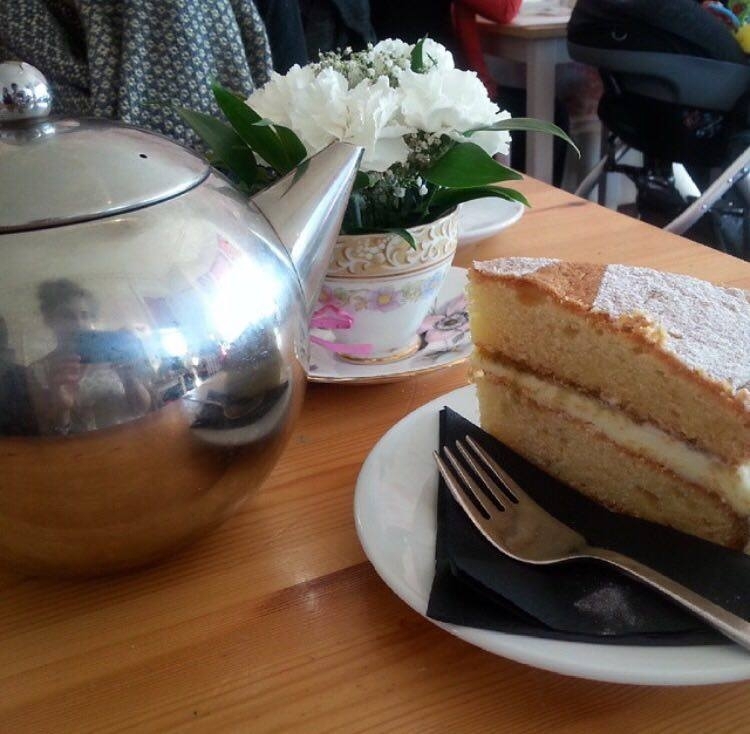 Jessie's Kitchen in Broughty Ferry has an amazing selection of cakes and traybakes alongside a 'scone of the week'. I'd recommend checking out their instagram page - @jessieskitchen - to see some daily pics of their mouthwatering cakes! One of Jessie's Kitchen's beautiful cakes! There is also an amazing ice cream shop in Stonehaven. I can't remember the name of it but it's just along from the open air swimming pool. Well worth a wee trip! @VisitScotlandHeather its aunty bettys ice cream shop! Best one ever!! Can recommend the tea room in Delgatie Castle!! So cosy, atmospheric, (in the vault,) and amazing cakes! There's an amazing chocolate factory in Dumfries & Galloway called the Cocoabean Company which has a café and an indoor and outdoor play area. They have kids chocolate making classes and adults can get involved too with special truffle making classes. What’s even better is the shop, there are over 100 varieties of loose chocolates to buy, pure heaven! yummy! The tearoom at Colonsay House on Isle of Colosay ! Yummy cakes and tray bakes ! I can honestly say you will not be disappointed and and sitting out in the gardens WOW !